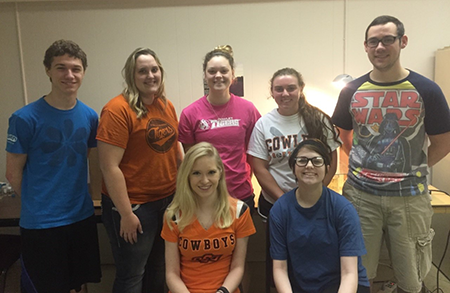 Seven Cowley College students recently completed a semester long research project that examined the effects of mixtures of sunscreen active ingredients or UV filters on Daphnia magna as part of a Research Methods Class. Previous studies had identified environmental levels of UV filters in Oklahoma lakes and their individual toxicity to Daphnia; this study advanced that knowledge by looking at their effects in combination. Acute tests were conducted to determine if the environmental levels were high enough to cause death and chronic tests were conducted to determine if the chemicals had effects on Daphnia reproduction. No significant effects on mortality or reproductive rate were observed in the study. This means that environmental levels of UV filters are not likely to induce toxicity in even the most sensitive of species such as Daphnia. There is some evidence to suggest the UV filters mixture may cause alteration in the normal proportion of males vs. females in the population, but a future study will be needed to make conclusive results. Students involved in the study included Cole Davis, Hannah Wilson, Kelsey Potter, Bradli Nowak, Easton Baker, Brittney McNown, and Katie Williams. Dr. Scott Layton, Natural Science Department instructor, supervised the project. Aside from the experiment, the students completed a professional presentation for the Natural Science Advisory Council and are in the process of completing a formal paper outlining their findings. The group was made up of three natural science scholarship students and four student volunteers seeking to gain research experience. The skills and experiences acquired in the class will provide students with a competitive advantage as they transition to their four-year colleges and into the workforce.